Paul Singh is a well-known entrepreneur, investor, and speaker based in Washington, DC. For the last few years, Singh and his partner Dana Duncan have travelled around North America visiting startup communities “that other investors weren’t visiting.” Along the way they’ve interacted with thousands of founders, investors, community leaders, and elected officials, and have seen first-hand what nearly 100 cities are doing to try to grow their startup ecosystems. 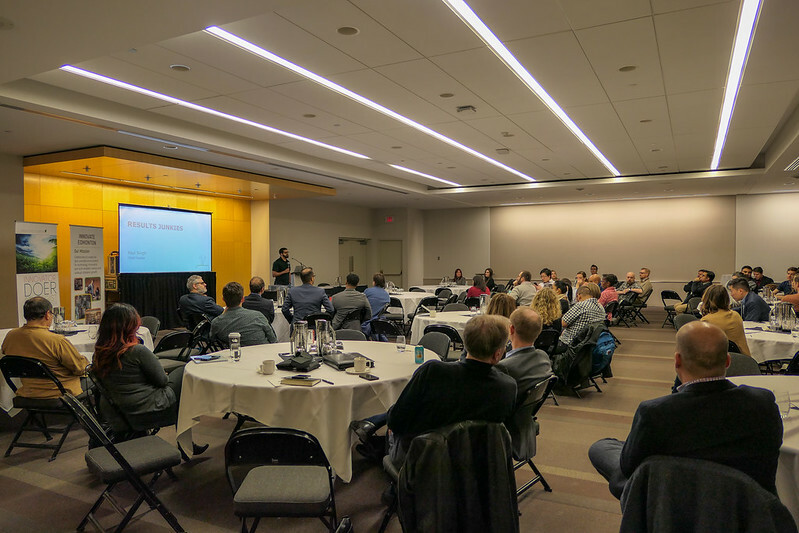 ScaleUp YEG brought Singh’s North American Tech Tour to Edmonton this week. He participated in a number of events on Thursday and Friday in addition to one-on-one meetings with local entrepreneurs to provide “mentoring and support” (and presumably to look for investment opportunities). I saw him speak on Thursday afternoon at the Edmonton Innovation Ecosystem Community (EIEC) meeting hosted by EEDC. “It’s not better anywhere else,” Singh told the room. “We could pick this room up and put it down in any other city and we’d have the same conversations.” Entrepreneurs would complain that there’s not enough money, investors would complain that there aren’t enough quality companies, and bureaucrats would complain that they’re being overlooked compared to others. Singh lamented the fact that entrepreneurs see investors as individuals with power that need to be won over, referencing Dragon’s Den and Shark Tank tendency to focus the camera on the investors as the popular reinforcement of this idea. He suggested investors are just like entrepreneurs, with a business to grow. Still, he didn’t hold back when it came to his advice for the entrepreneurs in the room. When asked which cities he has come across that are successfully building startup communities, Singh cited Kelowna, BC and Lincoln, Nebraska. But he quickly turned back to Edmonton. “I feel like Edmonton’s worst enemy is the people that already live in Edmonton,” Singh observed. “You guys are awful to yourselves.” He noted that in today’s world, ambition and access to information are both fairly evenly distributed. “It’s visibility that is not equally distributed,” he said. And that’s what Edmonton should focus on. “If you want to make Edmonton better, you don’t need collaboration,” he said. Instead, entrepreneurs need to pick up the phone 200 times a day and sell, investors need to just focus on making more money (wherever it comes from), and government officials need to drive visibility. “The only thing stopping more billion dollar companies from being here in Edmonton is the entrepreneurs not doing it,” Singh said. Both Singh and Reshef have since responded on Facebook. I understand that Singh, Reshef, and Putici have all spoken with one another and are ready to move on. So why mention the controversy at all? Two reasons. First, I think it is a reminder that people are generally making good faith efforts toward a common goal and that they really do care. Singh was not out to get anyone, the organizers did not intentionally mislead anyone about the intent of the session, Reshef did not complain or ask for the removal of Singh from Work Nicer, and Putici was acting in the best interests of the community he’s responsible for. I believe they all genuinely want to see Edmonton’s startup community succeed. The fact that they care so much is what makes incidents like this seem bigger than they are. Second, it does present an opportunity for everyone in the local startup community to reflect on the type of community we’d like to have. If we want a respectful, constructive, and accountable community then we need to be intentional about building it that way. I really enjoyed Singh’s talk. 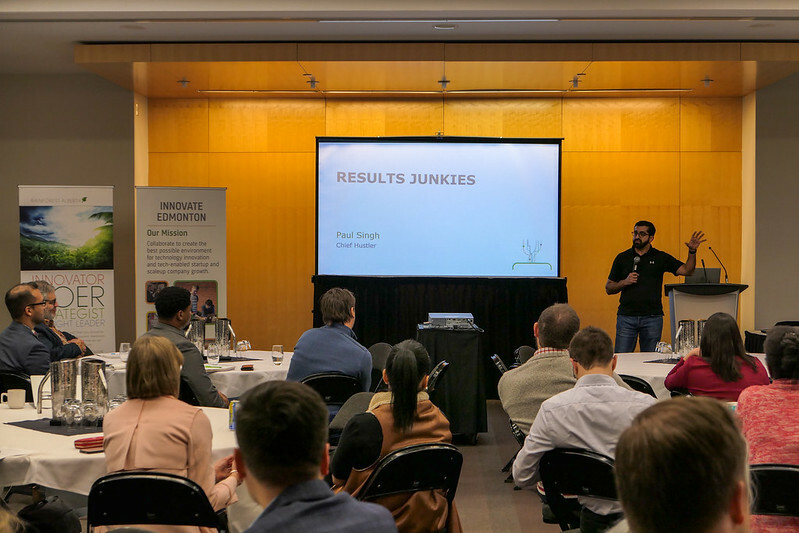 Though I am sure he has delivered the exact same message to countless other cities on his tour, he seemed genuinely interested in Edmonton’s startup community and attempts to improve it. I appreciated his reminder that often the grass is not greener on the other side, as well as his observation that Edmontonians spend too much time worrying about how we’re doing rather than just getting on with it. UPDATE: The pitch event took place at the Edmonton Convention Centre not at Work Nicer Beaver House as originally stated.